Help the Jarl of Riften to uncover and stop the illegal skooma trade in town. Discover a cache of moon sugar and skooma while investigating. Talk to Wujeeta after completing the Helping Hand quest. Report to the jarl about the presence of a skooma dealer in town. "Deal" with Sarthis Idren, and find evidence to locate his sources. Return to the jarl with the evidence. After completing the Helping Hand quest, you can ask Wujeeta where she obtained her skooma. She is not forthcoming with the details, however you can pass an easy-level Speech check to persuade her to tell you the truth. I think you owe me one. (Persuade) Passed: Okay, okay, I'll tell you. Here, does this help? (Bribe) Passed: Okay, okay, I'll tell you. And who says I won't? (Intimidate) Passed: Okay, okay, I'll tell you. At last, she will reveal her supplier as Sarthis Idren and his base as Riften Warehouse. She explains that the warehouse is always locked and that only the jarl has a key. The next step is to report the presence of a skooma dealer to the jarl. The current jarl in Riften will acknowledge Sarthis and his illegal operations. However, the dealer has informants in the town guard because he disappears every time they raid the warehouse. Perhaps, an outsider may be able to surprise Sarthis in the warehouse, and "'convince' him to close down his operation". If you accept the mission, you will be given the Riften Warehouse Key to unlock the warehouse. The warehouse is located at the southern end of Riften's docks. Orini Dral is patrolling the warehouse, and will immediately spot you. Sarthis is in the basement and will come rushing upstairs to aid his bodyguard. Orini is a modest opponent, but Sarthis can prove a difficult opponent to defeat. When they are dead, loot Sarthis' body for his key. Descend the stairs in the northeastern corner, turn around and use the key to unlock the door. 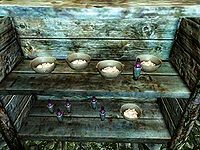 On the shelves there are five bowls of moon sugar and six bottles of skooma. On the table there is another bowl of moon sugar and two bottles of skooma. Inside Sarthis' satchel there is a note with information regarding Sarthis' sources. Make sure to read the note to advance the quest. Return to the jarl with the evidence and news of Sarthis' demise. The jarl will be grateful, saying, "It's nice to receive good news for a change", but will ask you to continue the crusade, which starts the next quest. If Wujeeta dies before you report the skooma dealer to the jarl, you will fail the quest, making it impossible to become thane of the Rift regardless of who the jarl is. If Sarthis is killed by anyone other than you, you will fail the quest. The key and the note can still be obtained, but no relevant dialogue option will be available from the jarl to proceed. If you manage to sneak past or Calm Orini, you can spare his life. Only Sarthis has to die for the quest to progress. This is the second of three required quests that are required to unlock the option to become Thane of the Rift. There are additional requirements noted on that quest page. The penultimate objective, "Recover skooma source information", will only register as completed if you read the note, unlike most other objectives of this type which only require you to take a note. If Maven is the jarl, she will ask that you tell Sarthis "Maven sends her regards." Even though you were given a key by the jarl, and it is occupied by enemies, you will be considered to be trespassing in the warehouse. If you have a follower they will react as such. If your follower insists on reporting you for stealing the note, you will need to exit the warehouse to ask them to wait. The following empty quest stages were omitted from the table: 250. On the PC, it is possible to use the console to advance through the quest by entering setstage FreeformRiften20 stage, where stage is the number of the stage you wish to complete. It is not possible to un-complete (i.e. go back) quest stages, but it is possible to clear all stages of the quest using resetquest FreeformRiften20. This page was last modified on 23 March 2019, at 07:33.